I’m releasing one of my private plugins since many people are requesting it. This plugin is an extension of PlaceholderAPI that adds many pixelmon features. It can be used with many plugins. 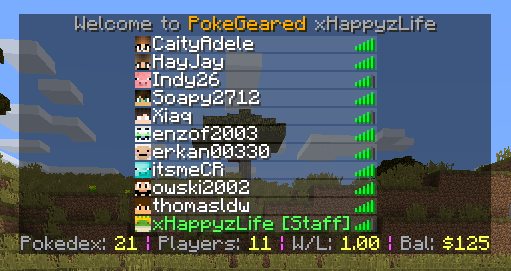 Like Proxying’s Tab Manager (in the upcoming build), EasyScoreboards and everything that supports placeholders. You can find all the placeholders in this page of the wiki. Please report any bugs you find in the GitHub Issue Tracker or in this topic. Thank you for the API itself, i love it! How do I install this? Is there a tutorial? OK! Thank you, I’ve understood. Have it both in the folder. When I press tab, it looks like before. Do you have an idea what it is? My mod doesn’t add anything to your tab, my mod adds the ability to use pixelmon’s placeholders with other mods. For example you’ll be able to add these informations to your scoreboard through EasyScoreboards because that plugin lets you use placeholders, so you can use, for example, %trainer_dexcount% in EasyScoreboards (read the thread, don’t ask here how to, please). For the Tab Manager i’m sorry but the latest version still doesn’t add placeholders support, you may be able to build it yourself but i do not think it’s your case. I have nothing to do with that btw. Would it be possible to add placeholders for how many pokemons you’ve killed/defeated? xD that would be fun to have. I’m pretty sure I’ve seen such line before in the api while messing around where you can get the number of pokemons you’ve killed in total. Pixelmon died and this mod too, cya in other projects guys! @happyzlife would you like me to lock your thread? Surprise! I’m back with an update. I upgraded to PlaceholderAPI v4.1 and added a few placeholders. You can read the full changelog here. How do you use this plugin like its giving me such a hard time please kill me now and make a video on how to use it and tab manager and or easy score board please Jesus like wow. Are you serious? At least try to read what i wrote. Read the PlaceholderAPI’s wiki and then read my wiki. Updated to PlaceholderAPI v4.2 and modified some placeholders. You can read the full changelog here.